This fantastic freestanding dishwasher from Miele offers 7 different programmes including options for intense washes and gentle cleans. EcoPower is a water saving cycle which still provides you with a fantastic finish, it also saves on your energy bills too! If you need clean dishes in a hurry then the QuickPowerWash is the setting for you. This handy programme runs in under an hour and the performance is just as powerful as a longer cycle. There's room for up to 14 place settings, and it boasts an A+++ energy rating and a noise level of 43 decibels. This unit is designed to fit under your worktop and will require a cold water feed and a waste outlet. 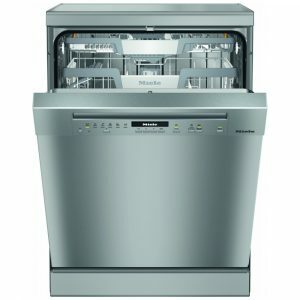 This superb freestanding dishwasher from Miele offers 7 programmes including options for intense washes and gentle cleans. You can save more on your energy bills by using the EcoPower setting as this consumes as little as 6 litres of water per cycle. QuickPowerWash leaves you with perfectly clean dishes in just 58 minutes which is ideal if you have a busy household. There's plenty of room with space for up to 14 place settings, and it boasts an A+++ energy rating and a noise level of 44 decibels. When your pots are dry, the door will automatically open thanks to Miele’s patented technology. This unit is designed to fit under your worktop and will require a cold water feed and a waste outlet. 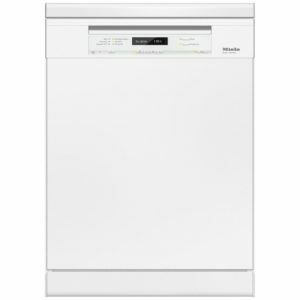 This superb freestanding dishwasher from Miele has a total of 7 programmes including options for intense washes and gentle cleans. Easy to load, the FlexBaskets are designed for maximum storage and the protection of your crockery. There's room for up to 14 place settings, and it boasts an A+++ energy rating and has a low noise level of 44 decibels. The QuickPowerWash option ensures perfectly clean dishes in less than an hour and there is also an EcoPower setting that reduces water usage and in turn, your energy bills! This unit is designed to fit under your worktop and will require a cold water feed and a waste outlet. 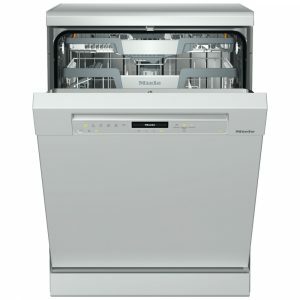 This outstanding dishwasher from Miele offers a total of 8 programmes including options for intense washes and gentle cleans. A new feature to the world of dishwashing, AutoDos is Miele’s new automatic dispensing function that uses PowerDisk to dispense the exact amount of detergent to the cycle at the required time. A PowerDisk can last up to 20 cycles on average and ensures you are using the precise amount of detergent required. You are able to pre-programme your dishwasher with AutoStart so that forgetting to put the dishwasher on becomes a thing of the past. There's plenty of room, with space for up to 14 place settings, and it boasts an A+++ energy rating and a noise level of 43 decibels. This freestanding unit is designed to fit under your worktop and will require a cold water feed and a waste outlet. Packed full of features, this fantastic dishwasher from Miele will make cleaning the dishes simple and effective. There's space for 14 place settings, and with Extra Comfort baskets, there are flexible and secure places for all sorts of different items. There are 8 wash programmes to choose between, so you can pick the perfect option for your pots and pans as easily as delicate glassware. Thanks to the A+++ energy rating, you can keep running costs low, while the 44dB noise level won't interupt you. This exceptional freestanding dishwasher from Miele offers a total of 8 programmes including options for intense washes and gentle cleans. AutoDos is a unique feature to Miele appliances which will automatically dispense detergent during a cycle using the precise amount that is needed. A PowerDisk is used to release the detergent and lasts on average for up to 20 cycles. Other great features include the EcoPower which reduces water usage to as little as 6 litres per cycle. Another is QuickPowerWash which ensures you perfectly clean dishes in under an hour. There's room for up to 14 place settings, and it boasts an A+++ energy rating and a noise level of 43 decibels. This unit is designed to fit under your worktop and will require a cold water feed and a waste outlet. 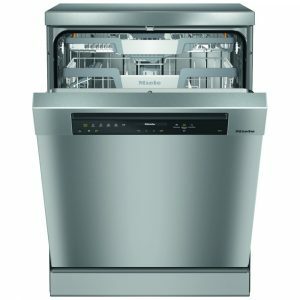 This fantastic freestanding dishwasher from Miele offers a total of 8 programmes including options for intense washes and gentle cleans. There's room for up to 14 place settings, and it boasts an A+++ energy rating and a noise level of 42 decibels. One highly useful feature is AutoDos, this allows the dishwasher to dispense the perfect level of detergent into the cycle at the exact required time, making the most of your detergent. The AutoDos is used with a PowerDisk which can last for up to 20 cycles on average. You can programme the dishwasher to start at the most convenient time for you with AutoStart. This Miele unit is designed to fit under your worktop and will require a cold water feed and a waste outlet.